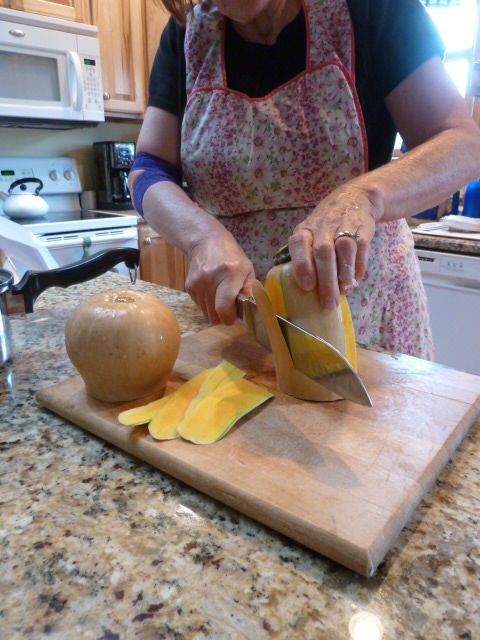 Butternut squash soup, children, cooking, food, Mennonite cooking, Shaping Families, Whatever Happened to Dinner? 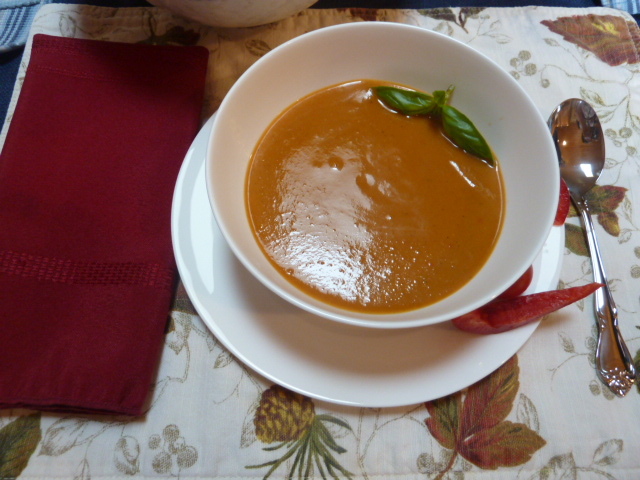 my thoughts turn to warm fall soups. If you have any butternut squash lying around or available at your farmer’s market, today’s recipe was brand new for me when I first made it two years ago. 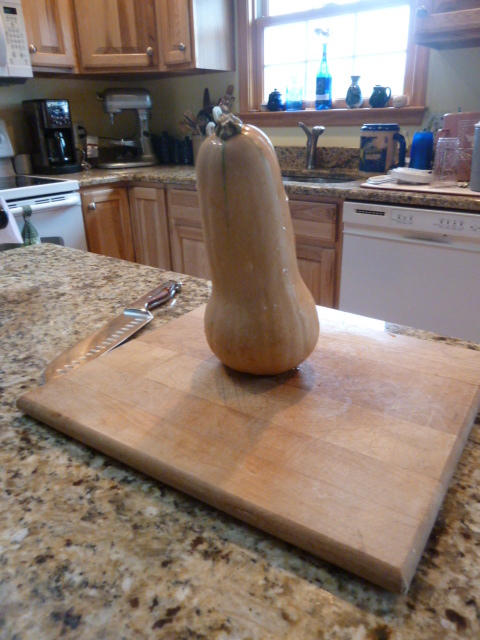 It was a stretch because I had never messed with a butternut squash, figuring it was as hard to peel as a pumpkin, a chore which I hated. 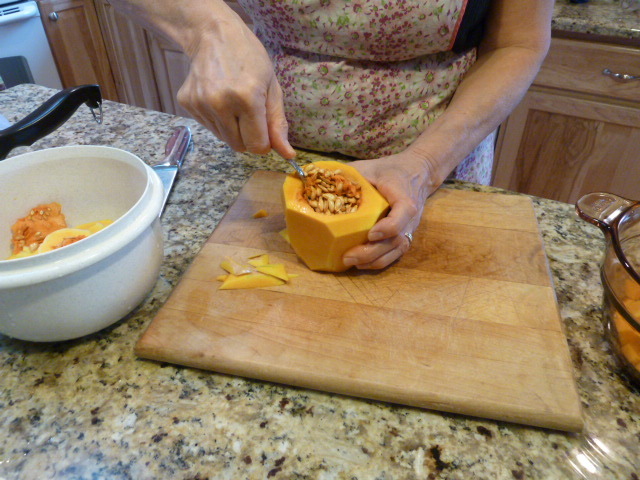 But the Internet came to the rescue when I found a tutorial, giving step-by-step instructions on how to peel the butternut squash, which I’ve kind of duplicated below with my own photos and steps. But first a story from my oldest daughter at her first job away from home clerking for our local Food Lion when she first encountered butternut squash. An older woman came through the line with a new funny looking vegetable and I knew I had to type a code into the computer for it. So I picked it up and asked her what it was (so I could look up the code). She seemed a bit surprised that I didn’t recognize it, but said “Buttuh-nut Squosh” with the rounded vowels of a good British accent. I couldn’t make out what she said so asked “what?” and she very kindly (and amused I’m sure) repeated it. 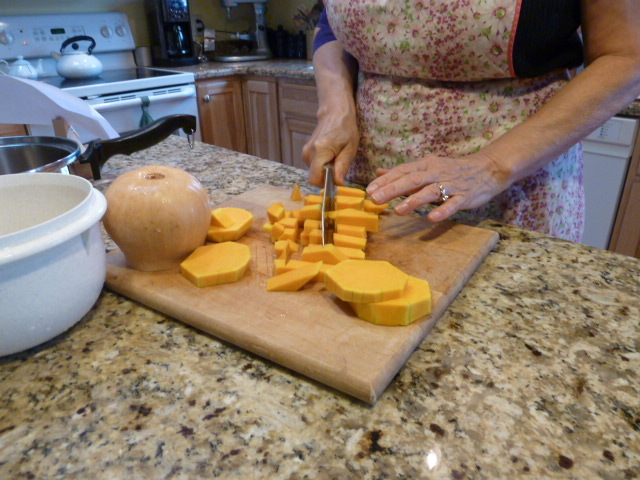 I’m usually pretty good with English accents, but I had never in my life heard of butternut squash, so the sound wasn’t immediately recognizable. I sort of sounded out the syllables into “American” and flipped through my code book until I could match it to Butternut Squash. And then of course I proceeded to see the word and the vegetable everywhere, as these things go. 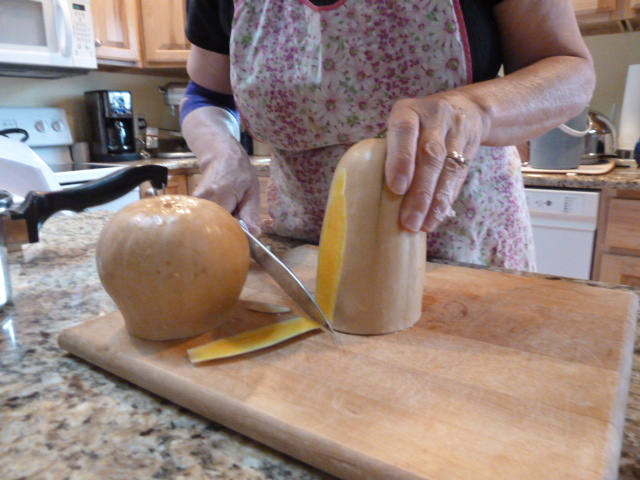 First, cut the stem from the base, then proceed to peel each side by holding the stem upright and with a large knife, slice down to the cutting board. Cut/peel the sides of the bowl too, and then scoop out the seeds. 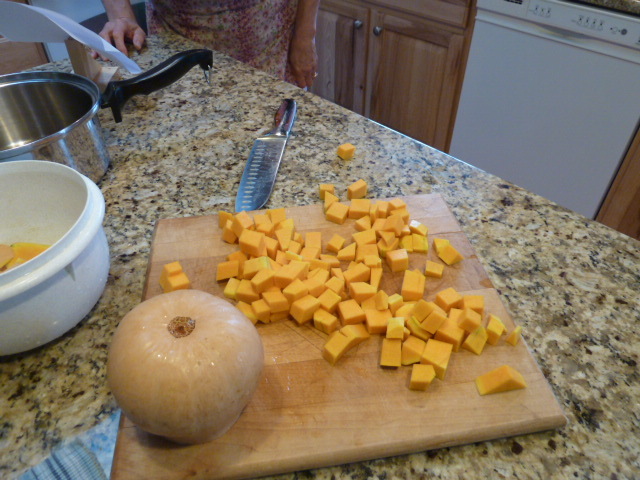 Slice the neck of the squash into 1/2 to 3/4 inch rounds, then dice to cubes. Cha ching! Nice cubes, to cook down into soup. Sauté squash, onions, garlic and sweet pepper in olive oil about ten minutes or until the onions look pretty well cooked. Add water or broth, tomato paste and spices. Add salt and pepper to taste. Boil until veggies are soft. Puree. Return to low heat. 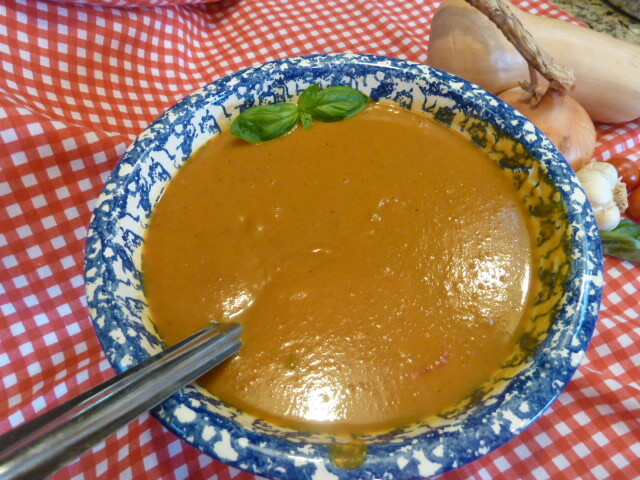 Add milk or cream until soup is the consistency you like. May add more salt if needed. Parsley and cream make attractive and tasty toppings. See the index of more Shaping Families recipes here. Also find many many tasty recipes and Mennonite cookbooks here. Were you ever embarrassed by what you didn’t know about foods, or what your mom or dad failed to teach you, or things you never learned to like? I’d love to hear your stories.